Some may think the idea of having a distorted, overdrive bass guitar a fairly new concept. It depends on what you call new. If you’re thinking that they are produced to fit in with heavy metal and other similar genres. Well, that’s not exactly true. The earliest use of such a sound I am aware of was with Marty Robbins in the early 60s. Marty wasn’t into his heavy metal at the time. Then a few years later we heard what is more like the sound we are used to today with The Beatles on ‘Think For Yourself’ from the Rubber Soul album. Now it is a commonplace sound, used by many, and with some great results. So, You Want To Add Some Overdrive To Your Bass Guitar? Just A Single Effect Or Other Options? As the name implies, this one is just a bit aggressive. All analog, this pedal can be driven very hard and has as we shall see endless varieties of sound options. Essentially the pedal is controlled via seven controls. But be warned, the descriptions of the controls only go part way to describing what they actually do. Low, mid and high are self-explanatory but only give an insight into what they are capable of producing. Just by altering the settings on each control, the sound changes either by just a little or an awful lot. They act effectively as a three-band EQ. Using the level and drive controls you can vary the sound from something really quite mild to a sound that will melt your face and all points in between. As we mentioned at the beginning, the use of the EQ and the level and drive controls will provide endless sound options. Another control is rather strangely named RIP. We had this vision that by clicking it the occupants of the first three rows at a concert may be sent to another place. Thankfully it isn’t true. What it does do is create an alternative harmonic sound to form two separate sounds which it then joins together. A brilliant feature. This pedal will act as a gentle fuzz, a full-on distortion or if you use the controls, just as a bass boost. It is a well thought out piece of kit. Perhaps the most important feature is that this pedal offers a lot of variety in sound. A variety of tones and sounds. 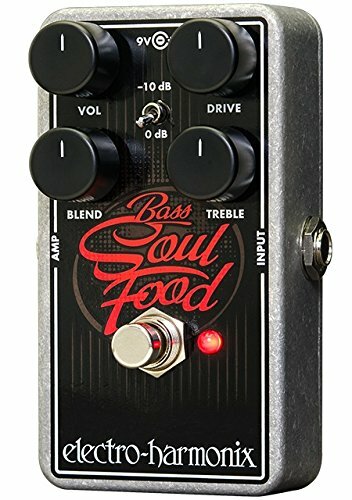 Less of what might be called a fuzz pedal for bass but more like a pure overdrive, this pedal does a simple job and does it very well. There are options to play with the tones, but essentially this takes your sound and drives it on. It gives you the power of the overdrive but also acts as a clean boost if needed. Four controls dictate the sound levels and options. The drive control allows you a choice between a punchy clean sound at one end of its scale to a full distorted overdrive at the other. In between, there are some nice shades of overdriven output. The blend control will mix together your choice of clean and distorted sound which adds more nice coloring of the sound options. The treble control is really a tone control adding or reducing the higher frequencies. The volume, of course, speaks for itself. It has a toggle switch to control instruments with a higher output level. It’s a well-designed pedal, easy to operate but giving you a good many options without going too far. 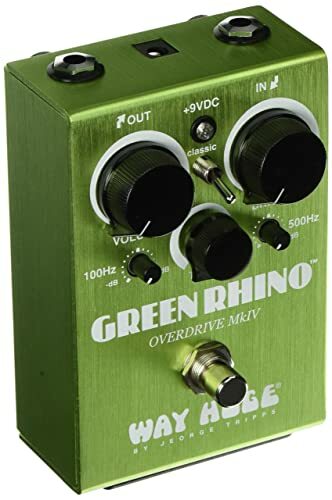 It doesn’t produce a very heavy fuzz or distortion so is not going to suit some players, it is a bit more gentle than that, offering sounds rather than just distortion. Made with tough casing, it will easily handle any stage use. This is a nice sounding pedal. Realistically priced it offers an overdrive sound without it getting out of control. It requires a 9v battery but also comes with a power supply. Some may feel it lacks a really rough edge. This is a pedal with a powerful sound and it more than packs a punch. Well-designed, it incorporates features that give you some good sound options. When bass players first got the urge to rough up their sound a little with some overdrive the bottom end was always a problem and was often lost in the overall sound. This was obviously not a good thing for a bass player to lose. The M85 has four main controls, tone, and distortion, but then dry and wet. These are an interesting feature that makes a big contribution to the sound, controlling the level of the intensity of the overdrive signal. The tone control only affects the distorted signal and will let you cut back the top end thus allowing the bottom end to come through. Finally, there is a central switch to take you between two other effects SIL and LED. SIL delivers a compressed aggressive sound while LED a softer option with less attack. These are well thought out controls that provide a lot of options. This pedal still sits in the more aggressive category but it does have some softer options. It is though, to all intents, a nasty sounding pedal and at times a little difficult to stay in control of. The sounds are loud and very distorted and it is easy to just take it too far. The controls are very sensitive and therefore need handling carefully to maintain a good sound. If you are looking for a pedal at the ‘nasty’ end then this is worth some consideration. It is priced in the mid-range and is good value for money. Construction wise it is well made and rugged and will take a few knocks. Might not be suitable for those looking for gentler overdrive sounds. The Mark IV Green Rhino draws heavily on its respected forerunners and has the same bite and feel to it but simply has more power. The layout is simple and easy to use with the volume, tone and gain controls giving you a basic platform for the creation of the sounds. It has as a natural sound, a rather gritty feel to it and will certainly cut through. One area where it excels as a pedal is with the control of the EQ. The options are varied and effective and operate at 100hz as did the Mark II pedal, but now with a new 500hz control allowing you to cut or boost the lows. This allows you to return and use the settings that were available on the original pedal which are so highly thought of. Mixing the new with the old – a nice touch. It is loud and powerful and will deliver some shattering distortion, but it does have a softer side which you can access through the controls. The overdrive is aggressive but not in an uncontrolled way and can actually be made to sound very subtle. It does though have the ability to make you sit up and take notice when used at the other end of the scale. It is well made and sturdy and physically smaller than its predecessors. Set in the mid-price range it is worth consideration, especially if you were a fan of the Mark II. Good EQ offering sound options. Switch to revert to the Classic mark II settings. Won’t suit someone looking for a heavy distortion pedal. Electro-Harmonix has based the sound of this pedal on two iconic sounds that many bass players have ranked highly. 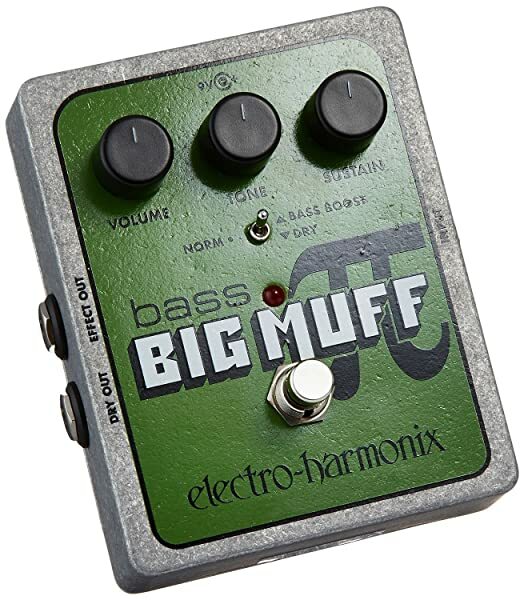 Namely, they are the Sovtek Big Muff Pi and the Bass Big Muff Pi. Both of them from a bygone musical age but both producing powerful fuzz tones. The pedal itself is fairly easy to operate having volume, tone and sustain controls. Each has specific work to do and interacts with the other controls. The distortion output level is controlled by the volume, but when the toggle switch is set to dry will not have any effect on your basic bass sound. The tone is self-explanatory giving you a range from a sharp toppy sound to deep bass. The sustain control is a welcome addition for some bass players using this effect. It will give you an increased sustain level without overdoing the distortion which is a nice feature. In the center of the pedal, looking a little bit overshadowed, is a 3-way toggle switch. This little offering provides so many options that its appearance on the pedal is rather understated. 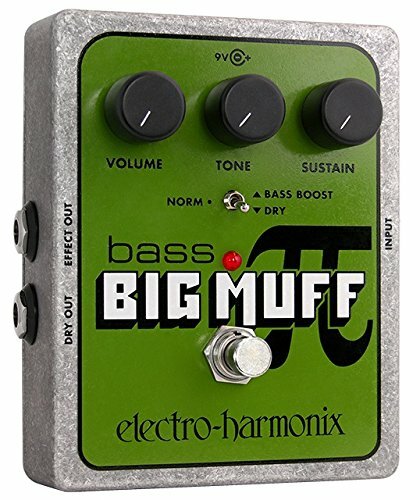 It will give you a bass boost, in the center position the sound of the Big Muff Pi and the lower setting will mix together your dry signal and the level of distortion being created. That is an important feature because at times too much distortion will cloud over the notes being played and just congeal them into a mess. This allows the clarity of the original notes to be the defining sound and the distortion a little extra to back it up. This is a powerful pedal and one with many sound options and all of them relevant. It runs on a 9v battery or an AC adapter. What makes it even more appealing is the price which is set towards the lower end. A quality pedal at a tempting price. Produces a range of great sounds. Sustain effect gives total control. The toggle switch does create a volume change when switched between modes. In case you were wondering where the Boss pedal was in this review, it’s here. Boss, the masters at providing basic quality pedals that do their job at a realistic price have come up with the ODB-3. You only need a very quick glance to know it’s a Boss pedal as it has all the typical features of pedal design that have worked so well over the years, including that off/on which seems indestructible. Just what you need really. It is made to tour and be used. It is an overdrive pedal designed especially for bass guitar. As Boss do so very well, it is made so that it is easy and straightforward to use. Four controls dominate sound production, Level, EQ, Balance, and gain. Basic operation producing basic sounds, but what sounds. The EQ is a two band effort that adjusts the sound parameters and allows you to make sure the bass end is not lost. The balance is the level of the overdriven sound. The sound options are quite wide-ranging with this pedal and you can add as much overdrive as you want or as little. You can mix with the dry signal to maintain clarity or you can push it to its limits where it will thrash with the best of them. It operates on a 9v battery or by ac adapter and comes with a 5-year warranty. Boss has done it again and come up with a pedal that is simplistic and produces the goods and at a reasonable price. It’s definitely one to have a look at. And here is the final answer in cost-effective but quality pedal manufacturers, Behringer, with their Bass Overdrive. They have really gone to town on this and produced a pedal that will compete with many of the best of them but at a ridiculously low price. The controls are simple to use and give a wide range of options. Designed specifically for bass guitars, it allows you to have total control over the bottom end when it’s being cranked up. It has a two-band EQ, and the usual level, gain, and balance. It doesn’t have much in the way of new or advanced features. This is a budget pedal after all, but what it does it does well. It delivers a determined fuzz sound and when pushed further it really will scream at you. 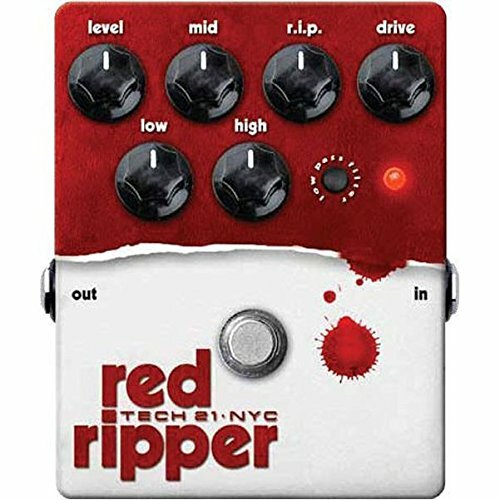 If you are looking for a bass distortion pedal with a little bit of variety and a solid sound then this is certainly an option. It has an LED for on/off and battery status, and is made of plastic, albeit quite a heavyweight variety, but that may dissuade some people. The price makes it even more attractive and you really can’t go wrong. Whilst it is a budget pedal, Behringer is a quality company that produces good effects. They are not always to everyone’s liking but they are always worth considering especially if your new to effects or don’t want to spend a lot. Easy to use with simple effective functions. Produces a variety of solid overdriven sounds. Lack of extra onboard facilities. Plastic construction may be a problem. 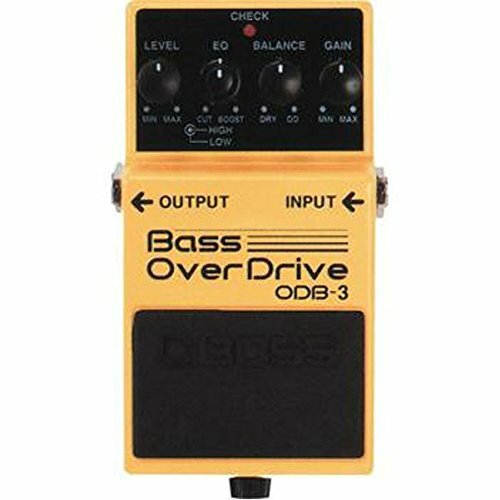 You have to be very careful when adding effects to a bass guitar, especially an effect that changes the sound and can swallow up the bottom end, as overdrive can if it’s not controlled. Overdrive, distortion, and fuzz are different things but the terms are often used interchangeably. They are though, all derivations of a similar process. When used in a controlled environment they can be very effective. Different pedals will produce a varied assortment of sounds and it is exactly what sound you are looking for that will go a long way to determining which pedal is best for you. They will range from a light distortion, the kind you might hear in soft rock or pop songs, right through to the heaviest of metal sounds, and will touch the bases all the way through. Is it just the one type of sound you are looking for or do you want to experiment? In our reviews, some pedals are adept at producing basically a good distortion or overdrive but then, apart from a few tonal options, leave it at that. Other pedals offer a myriad of options to indulge yourself in. 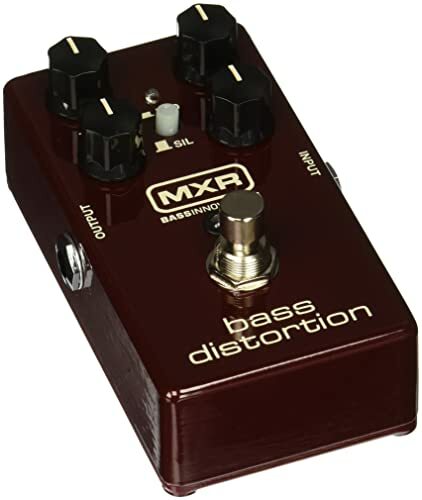 We have tried to look at some of the best bass distortion pedals to offer a guide to what will serve you best. This should help you find exactly what you are looking for. Normally with pedals and accessories, we like to keep things very simple. On this occasion, we have decided to be a little more adventurous and have gone for a pedal that will give us a lot of power but also a great many options to shape exactly the sound we will be looking for. A big sound with a lot of potential for a bit of creativity.